The name I'M PREMIUM becomes I'M SOLAR. Buy I'M.SOLAR® solar panel PREMIUM series at the best price exclusively online. Its efficiency is 16.05% ensures maximum power on your roof. Known for its quality, I'M.SOLAR® manufactures its cells and solar panels in Europe and gives you a warranty on quality and on performance. Thanks to advanced manufacturing, you get great value for money. With a product warranty of 20 and a 25-year guarantee on the linear performance, you can be sure your system will perform well on the long term. 20 year guarantee: The panels I'M PREMIUM 300 M black are guaranteed for a 20-year period. This covers all material defects during this period. I'M.SOLAR is one of the very few European manufacturers to offer this kind of service. This firm stands for great quality - which it underlies with its 20-year warranty. I'M SAFE warranty: The manufacturer warranty I'M.SAFE covers you in two ways. The serennity guarantee protects you for 5 years against theft, fire and meteorological events. The linear performance is guaranteed for a period of 25 years. I'M PREMIUM solar panels are fully protected. The manufacturer assures you ofits high quality and performance. 100% made in Europe: The I'M PREMIUM 300 M black is manufactured in a plant in Lithuania. It manufactures photovoltaic cells and solar panels. The production in company-owned plants ensures quality management at every stage of production. The company also produces its own cells: an additional value point for the company's solar panel. Products by I'M SOLAR stand for high quality and a long service life: You can definitely rely on them. I'M SOLAR is also among the very few companies that produces sustainable solar products. 60% of the energy used for manufacturing comes from renewables energies. An ecological product produced in an environmentally responsible plant. 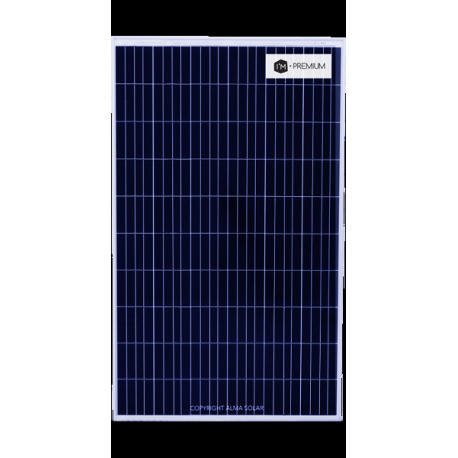 High-efficiency polycrystalline cells: These high-efficiency cells are manufactured in Europe and have a maximum efficiency of 16%. This enables a high energy production, even with strong temperature fluctuations: ideal for small- and medium-sized installations. Anti-PID treatment / Hotspot protection:The PID effect is a static charge which builds up between the solar panel's frame and the crystalline cells. After 2 to 3 years, this leads inevitably to a deterioration of the panels and production decrases by up to 80%. A hotspot refers to excessive heat generation at the junction of solar cells. The deterioration becomes visible as the cells turn black around the hotspot. It is detrimental to the solar energy production. Thanks to advanced manufacturing, I'M PREMIUM solar panels are protected against all these harmful phenomena for 25 years. Positive tolerance 0/+3%:I'M PREMIUM 270 P range between 270 W and 278,1 W. Precious additional wattage to optimise the performance of your solar installation. 03/21/2019 Très satisfait, aucun souci. Je recommande. Tout est très bien. Je vais passer une deuxième grosse commande.